NEW Vacuum Pack - NEW Formula! A revitalising blend of dried organic fermented barley, oat, wheat and alfalfa grasses, combined with algae and carefully selected spices, vegetables and seeds. High in fibre and protein, Beyond Greens blend provides greens from 10 different organic sources, including 4 fermented grasses and digestive herbs, and it also includes a source of naturally occurring Vitamin B12 and Iodine to support the skin and immune system. Each 8g scoop provides 3g of fibre, 3.4mg of iron, 48mg of calcium, 2g of protein and is considered two servings of organic vegetables. Beyond Greens provides all of the benefits of juicing vegetables without all of the sugar. Beyond Greens comes in powder form and blends quickly and easily into food and drink – making it great for people on the go who need an instant, nutritious boost or a quick pick-me-up snack. The blend of certified organic greens includes: fermented grasses, green vegetables, superfood algae and seaweeds. Fermented grass powder (barley grass*, oat grass, wheat grass, alfalfa grass, Lactobacillus plantarum, Saccharomyces boulardii, molasses), alfalfa powder, blended meal powder (flax seed, sunflower seed, sesame seed), barley grass powder, oat grass powder, rye grass powder, broccoli powder, ginger root powder, liquorice root powder, chlorella powder, dulse powder, spirulina powder, dried powdered kale leaf, cinnamon powder, natural flavourings (almond), natural flavourings (vanilla). SUGGESTED USE: Mix 1 scoop (8 g) as desired with a glass of water. Refrigerate after opening for optimal freshness. As with other high fibre products, initial consumption may cause gastrointestinal upset e.g bloating, gas, nausea in some individuals so drink plenty of water throughout the day. Beyond Greens can be used as a quick, nutritious breakfast or as a mid-morning or mid-afternoon pick-me-up instead of coffee or sweets. It is also ideal for athletes and people with busy active lives. Suitable for use during pregnancy. Below are reviews of Udos Choice Beyond Greens - 100% Organic - 255g by bodykind customers. If you have tried this product we'd love to hear what you think so please leave a review. Find this product very good and convenient to take whilst travelling. It helps me maintain a balanced diet. By adding a little fruit juice to water Beyond Greens is really palatable and l take is as a supplement to help my non-anaemic iron deficiency and macular degeneration And It Is Helping. Found this disgusting. What a waste of money had to throw it away. Doesn't mix with water and totally spoils anything else you mix it with such as juice or smoothie. I love this product, but I hate the fact that Udo's Choice is still including a single use (non-recyclable) plastic spoon in the packet. Please Udo's Choice, get the plastic pollution message and leave it out! Great and tasty product that I add to my smoothies. Good to know I'm getting excellent nutrition daily from this. Awesome product! I feel much better, eating habit improved and overall feeling healthier. Does not have a taste really, much of a texture. I like to drink it in my smoothie. I was very happy to discover this did in fact help keep me regular... a great way to take your greens. A great product that I've been using for a long time along with Udo's oils. A great source of B12 and I find the taste pleasant. As always - a great product from Bodykind at a competitive price along with free and fast delivery. Surprisingly yummy in overnight soaked oats, cinnamon, milled chia and flaxseed, raisins, seeds and milk or milk substitute/coconut water and yogurticaria! Just add 2 scoops and make enough for 2 days at a time. Leave in fridge overnight and add chopped banana and soya milk to taste in morning. The product does what it claims - it really supports my digestion well and gives me a nutritional boost at the same time. However, the taste is horrible compared to the previous version of Beyond Greens. I was also happier with it packaged in a jar as this envelope does not always reseal effectively. It's is a great product,I feel really good about myself, combined with Udo's Ultimate Oils, Happy Days..
Udo's green is the best green powder on the market as far as I can tell! I have been using it for years and find it easy to take and I notice real benefits. Very happy with this. Not taken it long enough to make a fair observation, but tastes good and I feel healthy. A great product, been buying for the last 2 years and recommended to family. Now organic so even better. Disclaimer: Having previously purchased the new formulation of this product from bodykind, I was offered the opportunity to receive a further product free of charge in return for writing an honest and unbiased review, which I have done. 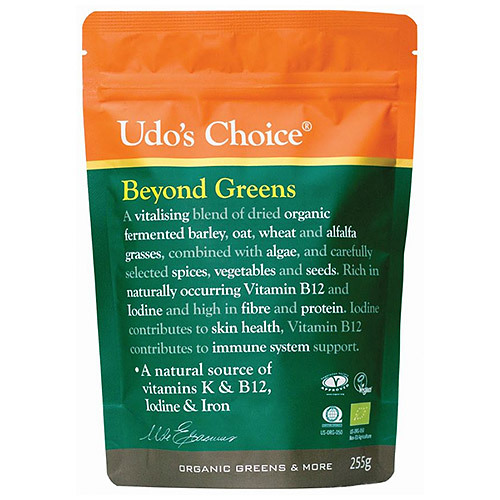 I have used Udo's Choice Beyond Greens for almost two years. I find that my body seems to function so much better especially the digestion and elimination. I generally feel more energetic and since I work out 4 times a week at the gym, my endurance and stamina has improved dramatically. My recovery period is also a lot shorter and I can train for longer. I also sleep better and wake up very refreshed. Tastes great mixed with fruit juice. I particularly love it with pineapple juice but any juice works a treat! My general health, fitness level and wellbeing is super since I started taking this powder! I think its fantastic. My husband uses this every day. He does not eat as many fruits or vegetables as I do and he feels this helps him to get optimum nutrition. I use it when I need a boost. I find the taste more bitter now it has been reformulated but he has not noticed any difference. The price from bodykind is the best we have found. I am aged 42, I have an 18 month old baby, I have used all the Udo's products during and after my pregnancy. I exercise everyday, even if its only a half an hour power walk and I'm sure the Udo's products have helped me mentally and physically, to cope with the demands on your body and mind during and after pregnancy. I feel fantastic and would highly recommend the Udo's products to everyone. Very good product, keeps my tummy in good order, arrived on time, Thanks guys. Disclaimer - having bought this product new formula from body kind I was offered a free bag of udos greens in return for writing an honest un biased review,which I have done . Have been using Udo's products for 10 years and the quality is excellent. I was feeling like I needed a change from the taste of the greens, and now the formula has changed, that's just what I wanted. Definitely prefer the new taste. Also prefer the new packaging as it's much easier to use when travelling. I put some in my smoothies - it's great. Love this product. Very important part of my routine. Tastes better than older formula. I've noticed no worse effects after switching to new formula. Great source of natural fibre and vitamins. Great product. Have been using for the last two years. I take it twice a day added to my breakfast and lunch. Tastes as good or even better than the old formula. Easy way to add natural fibre and vitamins/minerals to my day. Brilliant product good for my bowels and immune system. I have used this product almost every day for the last twelve years. But no longer. This is because of the recent change to its ingredients, which just happens to coincide with new packaging. Several ingredients have disappeared - to be replaced with molasses. The new product is a shadow of its former self. Why make the changes? I wonder if it's because this new version is cheaper to produce. It also now says on the new packaging "Now with added fermented grasses" - whatever they may be. The main thrust of the changes to the formula was to allow it to be certified organic and revise the green food content to improve the micronutrient profile available. As you noted, the previous formula had a large number of ingredients, many of which are not available in organic forms with any reliability. We are confident that the new formula continues to provide an excellent source of fibre, greens and phytonutrients, foundations of a healthy diet. Question about Udos Choice Beyond Greens - 100% Organic - 255g How should I take this? 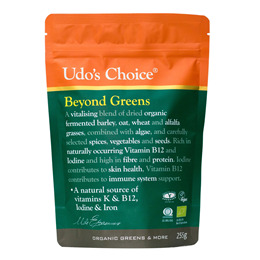 Question about Udos Choice Beyond Greens - 100% Organic - 255g How can taking Beyond Greens help with weight loss? There is no evidence to suggest Beyond Greens will encourage weight loss. However, it may well be a good nutrient packed product to take while embarking on a healthier lifestyle to make sure any reduction in food intake does not mean you take onboard fewer nutrients as a result. A revitalising blend of dried organic fermented barley, oat, wheat and alfalfa grasses, combined with algae and carefully selected spices, vegetables and seeds. This blend also includes a source of naturally occurring Vitamin B12 and Iodine.